Or maybe he does. Maybe he worked it out at the finish when he came second. Jarlinson Pantano was dropped at least three times on the final climb by Julian Alaphilippe. Each time he hauled his way back. Eventually he grew weary of being weary and returned the favour by attacking Alaphilippe. Shortly after, Vincenzo Nibali caught both of them and he soon went past. Alaphilippe couldn’t catch him, but eventually, after a while, Pantano could. So many times he looked dead and buried. Each time he had a resurgence. It was almost as if someone was whisking spent Pantanos off the road every time the camera cut away and replacing them with fresh clones. At the top of the final climb there were three: Nibali, the man with the best reputation for descending in the entire peloton; Pantano, who descends like a fiend; and Jon Izagirre, one of the many Basque climbing domestiques who pepper the bigger teams. Pantano went wide on pretty much the first corner and Izagirre got a lead. Nibali wasn’t closing it, so the final Pantano clone then went past him. And that was the order in which they finished: Izagirre, then Pantano, then Nibali – just about the exact opposite order you’d expect. That none of them died racing down a soaking wet descent was probably the greatest achievement of all. Joaquim Rodriguez put on a good display in his final Tour de France, gained some time and moved up to seventh overall. Roman Kreuziger was out in the break all day and made it up to tenth. The unlucky parties were Bauke Mollema and Fabio Aru. Mollema again looked a broken man, then he did a brief Pantano, but then he reverted to being a broken man again. He finished five minutes after the Froome group. The stage took poor Fabio Aru eight minutes longer than that. He’d looked feisty this final week, but at the foot of the final climb he was cold and visibly empty. Backmarkers rolled around him effortlessly. As far as winning the Tour de France goes, Team Sky did their climbing thing and then inched their way down the treacherous descent, so Chris Froome stays where he’s been for the last fortnight – ahead of everyone else. Here’s the top ten. 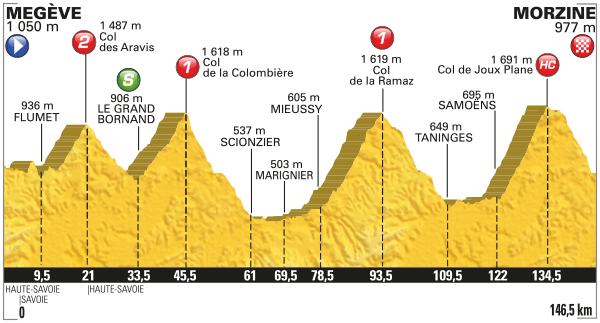 The final stage won’t have time gaps, so this is pretty much how they’ll finish. Dawdling around drinking Champagne and whatnot then a few laps of the centre of Paris and a sprint finish. 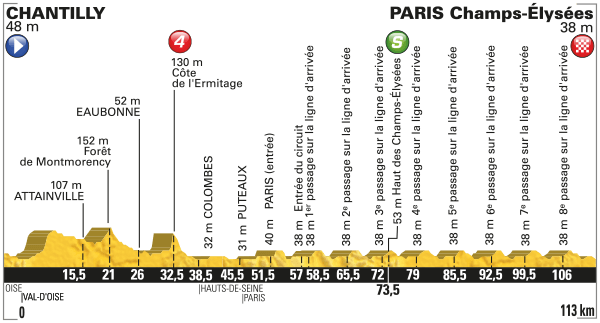 The somewhat tokenistic ‘La Course’ race for women also takes place today on the same roads. The riders get a good audience, but they’re almost literally presented as a sideshow, so I don’t really know how I feel about it. There’s a lot of ofs in the delicacies of this region: beer of Vexin, mustard of Gouzangrez, goat cheese of Chauvry, honey of Levallois-Perret and vineyards of Suresnes.